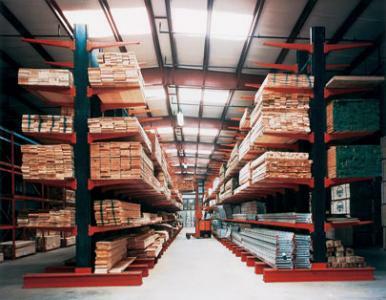 Cantilever Racks – Ridg-U-Rak, Inc.
Cantilever racks are equipped with columns and arms of varying sizes, determined according to the weight and load size of the products they will hold. They are composed of standardized units that allow for extra components to be easily added or removed as storage requirements change. This makes them an ideal storage rack option for companies who cycle through a variety of materials often enough to need a flexible structure for storage. A cantilever rack is used to hold, store and display goods. It optimizes space by allowing goods to be stacked vertically and horizontally on shelves, allowing inventory to be displayed in an organized manner. They can be found in retail stores, warehouses and homes, depending on which of the two major styles of cantilever rack is being utilized. The warehouse storage cantilever racks are usually made from structural or roll formed steel and are largely employed by lumber and plumbing suppliers. A folding cantilever tray is a smaller version of the cantilever rack that can collapse into itself for compact packaging. Rack manufacturers that produce cantilever racks utilize a variety of materials to create these popular models. However, one of the most popular metallic materials used for construction of the cantilever rack is steel and steel alloys. This is because steel is such a solid and strong metal, resistant to weather and chemical corrosion as well as retaining a hardness that has a high strength to weight ratio. The design of a cantilever rack combined with the materials used to create it are what allow vast amounts of weight to be supported by them, sometimes up to 6,000 lbs. depending on the design. Secondary processes such as powder coating finishes increase the lifespan of these already durable storage rack systems in both indoor and outdoor settings. Installing these racking systems can be done a number of ways depending on the needs of the company that has purchased them. For a permanent fixture that will not be altered on a regular basis, cantilever racks are known to be bolted to the ground or wall to ensure they stay put. They are also often left as free standing structures for applications that require adjustments often to accommodate different types of product storage. Cantilever Racks Cantilever racks are a type of storage rack that anticipates flexible future needs. A cantilever is defined as any rigid structure whose horizontal supports extend well beyond its vertical supports. They do not have any vertical obstructions and consequently are ideal for storing long, oversized items.